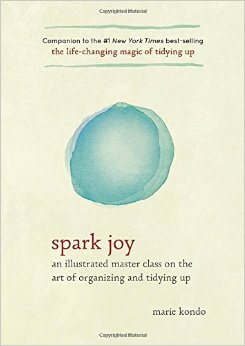 This is a follow-up to The Life-Changing Magic of Tidying Up, which I read and loved last summer. I spent six months last year doing a giant tidy-festival, and learned a lot in the process. I was really excited about this companion book, because I knew it had a lot of extras and continuations. On the other hand, there was one part of the whole process last time that I kinda skipped over, and that was the whole “imagining your ideal lifestyle” bit. I did try to do that, but the thing is, my ideal lifestyle is somewhat fluid. I’ve long had in me two contrasting ideas of a perfect lifestyle, and they’ve been in conflict since I reached adulthood. I only recently realized the source of that conflict, and now have a clearer idea of which direction to go, and so I plan to revisit this section more firmly before I do my mini-tidy marathon this fall. I wish I’d enjoyed this book more. It might have partly been my mood, but I suspect that it was the book itself. A lot of the information, and even stories, were repeats, and I didn’t find the illustrations to be particularly instructive. Ah well. This entry was posted in 2016, Adult, Prose and tagged Asia, KonMari, nonfiction, POC, translation. Bookmark the permalink. Boo. It’s too bad there wasn’t more new information or guidelines in it. What do you think the purpose of the book is then? Is it meant to be read almost simultaneously with the first one? Is it a book to read as a refresher after a few years? Is it just a marketing ploy to get more money from the trend?